This chapter contains step-by-step tutorials for creating new installers using Graphical Installer Wizard. With this tool whole installer can be created by a few clicks - no manual writing is necessarry. Create new installer - use this option to create new skinned installer from scratch (Graphical Installer Powered Installer). Wizard will offer you many options - how your new installer will look, which files it will contain and many other features. Convert existing Inno Setup script - this option is suitable in case you have a Inno Setup script (.iss file) for your installer and you wish to enhance it (to skin it with Graphical Installer). Wizard will convert your script into Graphical Installer Powered Installer. There is no difference in Graphical Installer Wizard among various IDEs. Graphical Installer Wizard is always the same - the pages, the behaviour, the generated installer, etc. are always the same. There are small differencies in installation and configuration. But your resulting installer (script file) is never affected. Graphical Installer Wizard is available as plug-in for several IDEs: Visual & Installer, RAD & Installer, Inno Script Studio and as Standalone application. 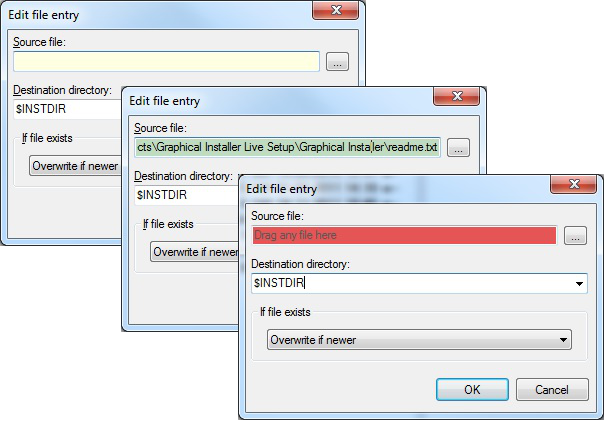 These IDEs are not part of Graphical Installer installation package - you need to download them separately. We recommend you to use these IDEs for an easy way of creating and editing script files (.iss). These tools provide a lot of functionality (like syntax highlighting, word completion, ...) which can resolve many errors occurring during development. Visual & Installer is a Visual Studio extension for creating Inno Setup installers. It integrates Inno Setup with Microsoft Visual Studio and allows you to create and build Inno Setup projects right within Visual Studio getting all benefits of this environment. RAD & Installer is a RAD Studio extension for creating Inno Setup installers. It integrates Inno Setup with Embarcadero RAD Studio and allows you to create and build Inno Setup projects right within RAD Studio getting all benefits of this environment. Inno Script Studio is an Inno Setup IDE useful for experts and beginners in the creation of Setup programs with the Inno Setup. Standalone application provides the same functionality without any IDE (or with standard Inno Setup ide called Compile32). With Graphical Installer Wizard you can generate whole installer or convert your existing Inno Setup script. This Wizard will generate for you both <project>.iss and <project>.graphics.iss files as so as necessary image resources. Generated files can be immediately opened and compiled - and your new installer is instantly ready for action.